Clearly the Silverlit XTRC 3-in-1 set is not your typical RC. Buying & using this thing is not about just opening a box & driving away. You actually get to make several choices right from the start. The standard configuration gives you a somewhat futuristic-looking, sleak open-wheel racer with four low-profile tires. However, if you want, you can change out the entire front section for a unique steerable single-wheel unit with one extra-large wheel & tire. If you want big tires on the rear, too, you can make that happen. They call it a 3-in-1, but depending upon how you look at it, you get to run one of 2 completely different styles of vehicles, and each has two rear tire choices, so it's a total of 4 possible combinations. Adding in batteries presents yet another choice. If you have regular AA batteries, pop in six and you're ready to go (rechargeables preferred of course!). If you want to get the most performance out of your XTRC, remove the AA battery tray an install a standard-sized 9.6V NiMH rechargeable pack (you have to buy it on your own though). Pretty sweet. Even the controller has options. Silverlit has recognized that some people are left-handed (about time! ), and you can easily move the steering wheel to either side. The controls are proportional, to boot. The Silverlit XTRC-01 accelerates quickly and has a respectable top speed in the standard configuration with 4 small tires. Steering is very responsive, and proportional control means you can adjust your tuning radiu as you need to get around any shape of corner. The only thing that wasn't so great was the radio range. I found the car would lose its radio connection at around 30 to 40 feet away and coast to a stop. Swapping on the larger rear tires makes the XTRC-01 even faster, to the point where if you don't have either a large open space to run in, or pretty good reflexes, it can be challenging to keep the car on course. Interestingly, with the extra speed of the larger tires comes a reduction of steering stability. Turning at full speed with the big tires will often result in the car spinning out, so you have to either slow down or take wider turns. I really liked this trade-off, as if the the change only made things better, there would never be a reason to change back. Having both pros and cons gives the driver the option to put extra thought into his/her choices and matching the equipment to the circumstances. The single front wheel option makes the car more stable in a straight line, but it won't turn as sharply as with two wheels if you have the smaller rear tires on. With larger rear tires, all of the trade-offs start to work together (or perfectly against each other, depending upon how you look at it). The front wheel reduces steering, but the big rear tires increase it. However, now the car will tend to lean over in turns sometimes, lifting the inside rear tire completely off the ground from the "g" force. 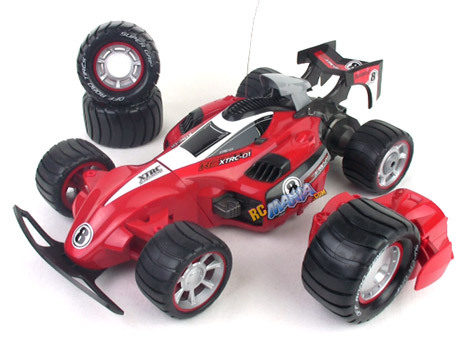 The Silverlit XTRC-01 3-in-1 RC car set is really different. There are always customizable non-motorized toy vehicles on the market, but it's rare to see this with toy-grade RCs that you can actually drive & control. I feel like Silverlit got it right with the ease & speed of swapping the different components out, and the unique driving characteristics of each configuration make sure the different options are really worth it, and not just gimmicks. The short radio range I experienced was disappointing, but not bad enough to bother me too deeply, as a 60 to 80 foot square field of play with the driver in the middle is reasonable. The inclusion of a rechargeable battery set would have been highly welcomed, but for the price you pay and how much play value you get, I think the overall value is pretty good.